The Shure SM7B is a warm, detailed sounding vocal microphone that is ideal for close-range vocal applications such as radio broadcasting, TV.. 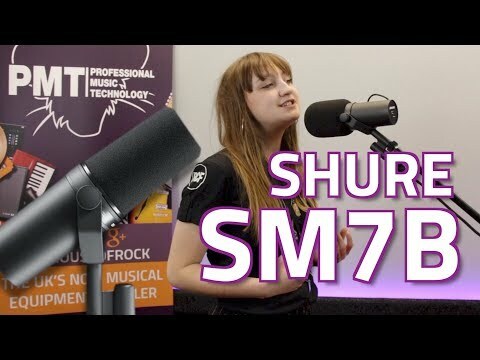 The Shure SM7B is a warm, detailed sounding vocal microphone that is ideal for close-range vocal applications such as radio broadcasting, TV talkovers, and general studio lead vocal recording. Courtesy of a wide-range frequency response, bass roll off and mid-range control, and internal air suspension shock isolation, the Shure SM7B has established itself as the go-to microphone for Broadcast Studios around the world. As well as spoken word, vocal song performance and interviews, the SM7B also provides a unique response for guitar cabs and amplifiers, subsequently used on successful recordings over the past 2 decades. It specifically shields against electromagnetic hum caused by studio monitors and speakers, so it delivers a noise-free signal for professional users who demand the highest quality without compromise. The included internal "air suspension" shock isolation virtually eliminates mechanical noise transmission too. The SM7B features a standard high-density windscreen and an additional A7WS detachable windscreen, designed to reduce plosive sounds and gives a warmer tone for close-talk vocals. The updated Shure SM7B features a hassle-free cable management system and upgraded bracket design to offer greater stability. This also allows for easy rigging into a studio environment via XLR connectivity. Compatible with a wide range of microphone arms and clamps. Shure SM Series Microphones are equal to the demands of high-energy performance, proven time and time again through decades of rigorous use by performers and engineers of all experience levels. I can say that this is the best microphone I've ever owned, hands down. I won't get into techy stuff, but if you're looking for a microphone that feels great, looks great and sounds great? This is it. I haven't tried any others in this price range and I'm pretty sure I'm not going to. I absolutely love it. The sound is incredible. I feel a sense of grandeur when I use it. It is everything the reviews said it would be. In my mind, this is as close to perfection as it gets. Love it!!!!!!!!!!!!!!!!!!!! !